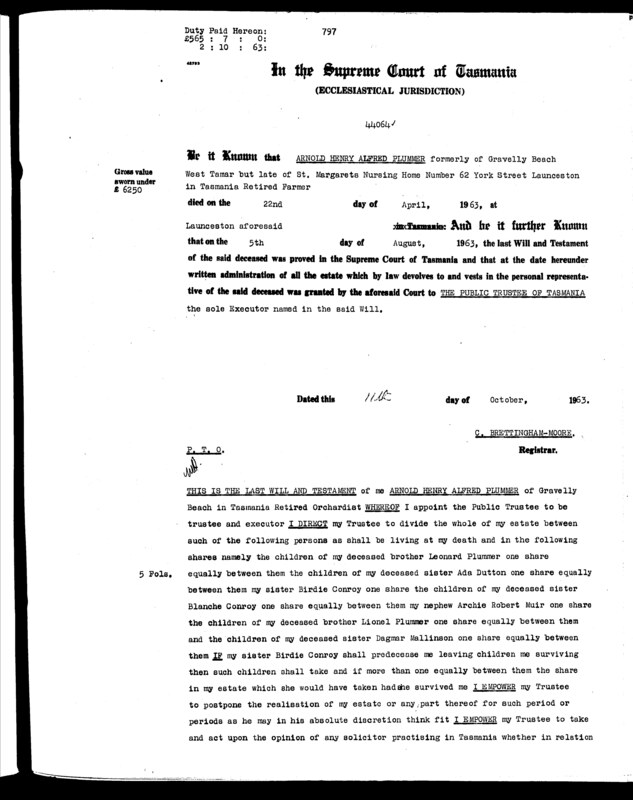 Probate granted by the Supreme court of Tasmania 11th October 1963. Will proven 5th August 1963. Will No. 44064, Last will and Testament of Arnold Henry Alfred Plumber. Will proved 5th August 1963, Probate granted by the Supreme court of Tasmania 11th October 1963. [S172] Linc Tasmania, Tasmanian Government, (Tasmanian Government), RGD33/1/48 no 144 Image 39 (Reliability: 3), 9 Aug 1870. See attached copy of 1870 Births in the District of Launceston Register. [S449] Electoral Roll for the State of Tasmania, 28 (Reliability: 3), 1943. See attached copy of 1943 Electoral Roll for Division of Wilmont, Tasmanaia. [S172] Linc Tasmania, Tasmanian Government, (Tasmanian Government), AD960/1/95 Will No. 44064 (Reliability: 3), 5 Aug 1963. See attached Last Will and Testament of Arnold Henry Alfred Plummer. Will No, 44064. [S172] Linc Tasmania, Tasmanian Government, (Tasmanian Government), AD960/1/95 Will No. 44064 (Reliability: 3), 11 Oct 1963.